Put potatoes in a large pot and add enough water to cover. Bring to a boil and let cook until they’re tender enough to easily pierce the flesh, but don’t overcook. Drain and let cool for about 15 minutes. Meanwhile, combine the mustards, vinegar, mayonnaise, chives and parsley, salt and pepper to taste (you might need extra salt, because the potatoes will absorb it), and 1/2 cup hazelnut oil. Stir. 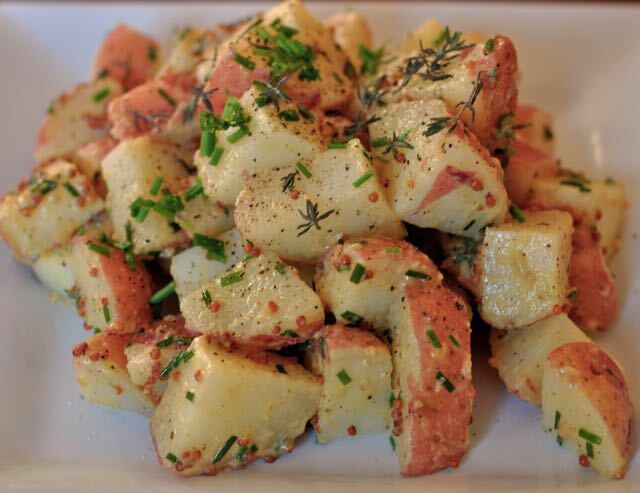 Slice the potatoes into coins 1/4″ thick. Toss gently with seasoning mixture. Taste and adjust seasoning as needed. Drizzle with additional hazelnut oil if it seems like the potatoes are dry. Serve warm or at room temperature.